We are hiring. Apply here. Help us better serve you by clicking on the link below to take the CCS Food Service Survey. · Nut products, seafood, and pork are not offered. · Seafood and pork are not offered. Columbus City Schools follow the MyPlate dietary guidelines for student meal planning. Eat a fruit or vegetable at every meal. Make healthy food choices! For more information, click on Eat Right with MyPlate. Taste Testing Request Form for teachers. 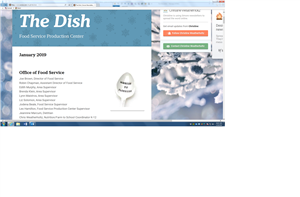 To read the latest edition of the Food Service newsletter, click here The Dish. For updates and information, follow Columbus City Schools on Twitter and Instagram @CCS_Food. Click on the Food Allergies link above to read about the Columbus City Schools Food Allergy Policy and links to additional resources. In addition, there are recipes that require no cooking or cooking by microwave, stove top or an oven. Other features include recipe cost per serving, nutrition information, and cookbooks. Look up a menu item by meal service for nutritional information and USDA food component(s). Africentric, Berwick, Colerain, Columbus Gifted, Indianola, Starling, Middle/High School Menu Nutritional Information Look up a menu item by meal service for its nutritional content and USDA food component(s).